The main manifestation of systemic sclerosis (SSc) is the overproduction of extracellular matrix, predominantly type I collagen. This study was undertaken to evaluate the effects of noncytotoxic doses of the topoisomerase I inhibitor camptothecin (CPT) on collagen production in the activated dermal fibroblasts from patients with SSc and healthy donors. The fibroblasts were cultured in the presence or absence of CPT. Production of collagenous proteins by fibroblasts was determined in cell and matrix layers by ELISA and in conditioned media by [3H]proline incorporation, gel electrophoresis, and autoradiography. Expression of α2(I) collagen (COL1A2) mRNA was measured by northern blot, and the activity of COL1A2 promoter was determined by a chloramphenicol acetyltransferase assay. CPT (10-7 M) decreased the deposition of type I collagen by 68%, of type III by 38%, and of type VI by 21% in SSc fibroblasts and to a lesser degree in healthy controls. Similarly, CPT (10-8 M to 10-6 M) significantly inhibited secretion of newly synthesized collagenous proteins into conditioned media by 50%. CPT (10-8 M to 10-6 M) caused a significant dose-dependent inhibition of COL1A2 mRNA levels and COL1A2 promoter activity, both by as much as 60%. The inhibitory effect of CPT on collagen production by fibroblasts from patients with SSc suggests that topoisomerase I inhibitors may be effective in limiting fibrosis in such patients. Systemic sclerosis (SSc) is a connective-tissue disease characterized by progressive thickening of the dermis, often accompanied by insufficiency of internal organs, such as the lungs, heart, or kidneys . These manifestations are due to the excessive accumulation of extracellular matrix proteins, predominantly type I collagen, in the affected tissues . The cause of SSc is unknown but the early stage is characterized by a dense mononuclear cell infiltrate in tissues, suggesting that activation of the immune system results in the development of tissue fibrosis [3,4]. A prominent humoral abnormality in SSc is manifested by the presence of anti-nuclear antibodies . The circulating anti-topoisomerase-I (anti-Topo I; Scl-70) antibodies are highly specific for SSc , and they are found in sera from 30 to 70% of patients . The presence of anti-Topo-I antibodies is associated with diffuse cutaneous involvement and pulmonary interstitial fibrosis  and is considered a predictive marker of diffuse SSc. Human DNA topoisomerase I (Topo I) is a 765-amino-acid nuclear enzyme  involved in topological changes of DNA structure . It plays key roles in DNA replication, transcription, and recombination. During the Topo I catalytic process, a transient covalent linkage, termed the 'cleavable complex', is formed between the enzyme and DNA strand nicks. Camptothecin (CPT) and its derivatives specifically target Topo I by binding noncovalently to these cleavable complexes, stabilizing them and interfering with DNA religation . As a result of CPT's action, single- and double-strand DNA breaks are generated, leading to premature termination of replication and inhibition of transcription . Cells can repair DNA breaks caused by low doses of CPT, whereas higher doses lead to cell death . Since many neoplastic cells are characterized by high levels and/or activities of Topo I [14,15], this enzyme has become one of the cellular targets for anticancer therapy [16,17]. CPT derivatives such as topotecan and irinotecan (CPT-11) are currently used in the treatment of various cancers [16,17,18]. Only limited side effects, such as manageable neutropenia, in patients who received high doses of Topo I inhibitors have been reported [16,17]. The mechanism responsible for the production of anti-Topo-I antibodies in SSc is not fully understood. Recent studies suggest that activation of Topo-I-reactive T cells is responsible for the induction and propagation of these antibodies in SSc patients . At present, the origin of their target autoantigen is not clear. Significantly, the disappearance of these antibodies, possibly because of removal of the autoantigen, has been associated with favorable outcomes . Because of the potential pathogenic role of Topo I in SSc, we undertook this study to evaluate the utility of noncytotoxic concentrations of Topo I inhibitors for the treatment of SSc. We have focused on the effects of the leading Topo I inhibitor, CPT, on collagen production by dermal fibroblasts obtained from patients with SSc. The subjects were patients with diffuse SSc and healthy volunteers. The patient group consisted of 18 individuals (10 women and 8 men) with a mean age of 39.5 ± 2.6 years. All the patients fulfilled the American College of Rheumatology criteria for the diagnosis of SSc . The control group were 18 healthy donors with a mean age of 41.0 ± 3.3 years. Dermal fibroblasts were obtained from clinically affected skin (on the dorsal forearm) of the SSc patients and from healthy donors matched with the patients for race, age, and gender. The control fibroblasts were obtained within several days of SSc biopsy and were processed in parallel. For the experiments, cells were starved for 48 h before the addition of CPT in DMEM/1% fetal bovine serum (FBS). CPT was purchased from Sigma (St Louis, MO, USA) and dissolved in dimethyl sulfoxide (Sigma). Aliquots of stock solution (10 mM) were stored at -70°C. Collagen and elastin deposition in cell and matrix layers was determined by solid-phase ELISA with antibodies against goat anti-collagen I (Chemicon, Temecula, CA, USA), mouse anti-collagen III (Telios, San Diego, CA, USA), mouse anti-collagen VI (Telios), or mouse anti-elastin (Sigma), at dilutions recommended by the manufacturers. To determine the effect of CPT on newly synthesized collagenous proteins, we used an established method of metabolic labeling with [3H]proline followed by SDS–PAGE electrophoresis . The results were visualized by autoradiography. The intensity of bands of collagenous protein was quantitated using NIH-Image (Densitometry Software, version 1.55). The effect of CPT on total protein synthesis was examined using metabolic labeling with [35S]methionine followed by SDS–PAGE and autoradiography. Fibroblasts were treated with CPT at concentrations from 10-9 to 10-6 mol/l for 24 h. Total RNA was extracted and analyzed by northern blotting as described elsewhere . Membranes were sequentially hybridized with radioactive probes for α2(I) procollagen and glyceraldehyde-3-phosphate dehydrogenase (GAPDH) and scanned with a PhosphorImager (Molecular Dynamics, Inc, Sunnyvale, CA) for mRNA quantitation. Transient transfections of normal dermal fibroblasts were performed with 20 μg of the -353 fragment of α2(I) collagen (COL1A2) promoter linked to the chloramphenicol acetyltransferase (CAT) reporter gene by the calcium phosphate/DNA coprecipitation technique as described elsewhere . CAT values were corrected to reflect the efficiency of transfection relative to the co-transfected pSV-β-galactosidase vector (Promega, Madison, WI, USA). Statistical signifance was evaluated in paired analyses using the Student's paired t test or the Wilcoxon test (nonparametric), depending on the data distribution. Data values are expressed as means ± SEM. Statistical significance was defined as a P value of 0.05 or less (see supplementary material). The effect of CPT on the production of types I, III, and VI collagen by 11 pairs of SSc and normal dermal fibroblasts was examined by ELISA using fibroblast cell and matrix layers (Fig. 1a,b,c). Incubation with CPT for 24 h significantly decreased the expression of all three collagen types, although the degree of inhibition varied among the different collagens. Although CPT at 10-7 mol/l decreased collagen production more in SSc than in healthy control fibroblasts (by, respectively, 68% and 48% for type I, 38% and 15% for type II, and 21% and 7% for type III) (Fig. a,b,c), these differences were not statistically significant. The reduction of type I collagen expression by CPT after 24 h was also demonstrated by immunocytochemistry and indirect immunofluorescence (data not shown). To assess the effect of CPT on production of other extracellular matrix proteins, the effect on elastin was measured by ELISA: no effect was found in either SSc or control fibroblasts (Fig. 1d). The effects of CPT on deposition of collagen types I (a), III (b), and VI (c) and elastin (d) in SSc and healthy control fibroblasts. Fibroblasts were grown to confluence in 96-well plates and then incubated for 24 h with CPT in DMEM/1% FBS. In control wells ('None'), the CPT was omitted. ELISA was performed on the cell and matrix layers with appropriate antibodies as described in the Patients and methods section. Bars show the relative amounts of collagen types I, III, and VI (a–c) from 11 pairs of SSc and healthy fibroblast cell lines and of elastin (d) from from four pairs of SSc and healthy fibroblast cell lines. All experiments were done in triplicate. CPT = camptothecin; FBS = fetal bovine serum; SSc = systemic sclerosis. *P < 0.05, **P < 0.005. The effect of CPT on newly synthesized collagenous proteins secreted into the media was examined in five pairs of SSc and healthy control fibroblasts in nine independent experiments. CPT at concentrations from 10-8 to 10-6 mol/l significantly decreased secretion of collagenous protein, by up to 50% in both cell types (Fig. 2a,b). The responsiveness of SSc and healthy control fibroblasts to different doses of CPT was also compared. 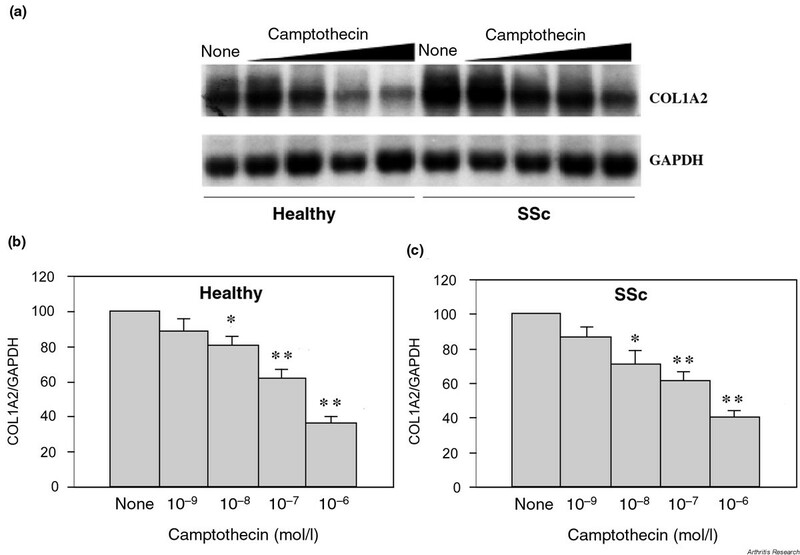 No major differences were observed at the three highest doses used (10-8 to 10-6 mol/l), but SSc fibroblasts appeared to be slightly more sensitive to the lowest dose of CPT (10-9 mol/l). Secreted collagenous proteins were inhibited by 29% ± 0.06 in SSc fibroblasts versus 14% ± 0.03 in healthy control fibroblasts (P = 0.09). The total protein synthesis was not affected by CPT treatment, even at the highest dose used (10-6 mol/l) (Fig. 2c). The number of cells after CPT treatment was not significantly decreased (Table 1), indicating that the doses used were not cytotoxic to fibroblasts. CPT is cytotoxic mainly to S-phase cells, and its effects are dependent on cell type . In general, human fibroblasts are more resistant than neoplastic cells or lymphoblasts to DNA-damaging agents . Although it has been shown that CPT at higher concentrations induces cell cycle arrest in proliferating dermal fibroblasts , it is unlikely that the inhibition of collagen production was related to cell cycle arrest, because our experiments were performed with confluent, serum-starved cells. Taken together, the experiments presented in this part of the study suggest that CPT is a relatively specific inhibitor of collagenous protein production in dermal fibroblasts. CPT inhibits secretion of collagenous proteins by both SSc and healthy control fibroblasts.Confluent fibroblasts in 12-well plates were incubated for 48 h in 0.1% BSA/DMEM containing ascorbic acid (50 μg/ml), and then treated for 24 h with various concentrations of CPT (none, or 10-9, 10-8, 10-7, or 10-6 mol/l). After CPT treatment, 20 μCi/ml of [3H]proline was added to the medium for an additional 24 h. Aliquots of conditioned media normalized for cell number were loaded on a 6% SDS–polyacrylamide gel. After electrophoresis, the gel was enhanced by fluorography and visualized by autoradiography. (a) Representative autoradiographs from SSc and healthy control fibroblasts. (b) Summary of quantitative analysis of the collagenous proteins expressed by SSc (left panel) and healthy control fibroblasts (right panel) after CPT treatment. Bars show means ± SEM from 10 (SSc) and 9 (healthy) independent experiments. The steady-state level of collagenous proteins in CPT-free controls ('None') was arbitrarily set at 1. (c) Representative autoradiogram of the total protein synthesis in the SSc fibroblasts after CPT treatment. Similar results (not shown) were obtained with the control cells. BSA= bovine sreum albumin; CPT = camptothecin; SSc = systemic sclerosis. *P < 0.05, **P < 0.005). Confluent fibroblasts after 48 h treatment with indicated doses of CPT were trypsinized and cell number was the mean of two counts using a Coulter counter. Values are mean cell numbers ± SEM from five SSc and healthy control pairs after treatment with CPT. CPT = camptothecin; NS, normal fibroblasts; SD, SSc fibroblasts. The effect of CPT on COL1A2 steady-state mRNA levels was evaluated in seven pairs of SSc and healthy control dermal fibroblasts in 13 independent experiments. CPT treatment resulted in a dose-dependent decrease of COL1A2 mRNA expression levels in SSc and healthy control fibroblasts as demonstrated by northern blot analysis. Note that GAPDH mRNA levels were not inhibited by CPT (Fig. 3a). The highest dose of CPT (10-6) resulted in about 60% inhibition of COL1A2 mRNA levels in both SSc and healthy control fibroblasts (Fig. 3b,c). These results suggest that the inhibitory effects of CPT occur, at least partially, through regulating the levels of expression of collagen mRNA. CPT inhibits expression of COL1A2 mRNA in SSc and healthy control fibroblasts. SSc and healthy control cells were incubated with various concentrations of CPT (10-9 to 10-6 mol/l) and analyzed by northern blotting. (a) Representative northern blot. (b, c) Summary of quantitative analysis of northern blots from healthy control and SSc cell lines, respectively. All values were corrected for loading differences as determined by intensity of GAPDH mRNA. Values from the CPT-treated cells indicate band density relative to that of untreated cells ('None'), which was set at 100. 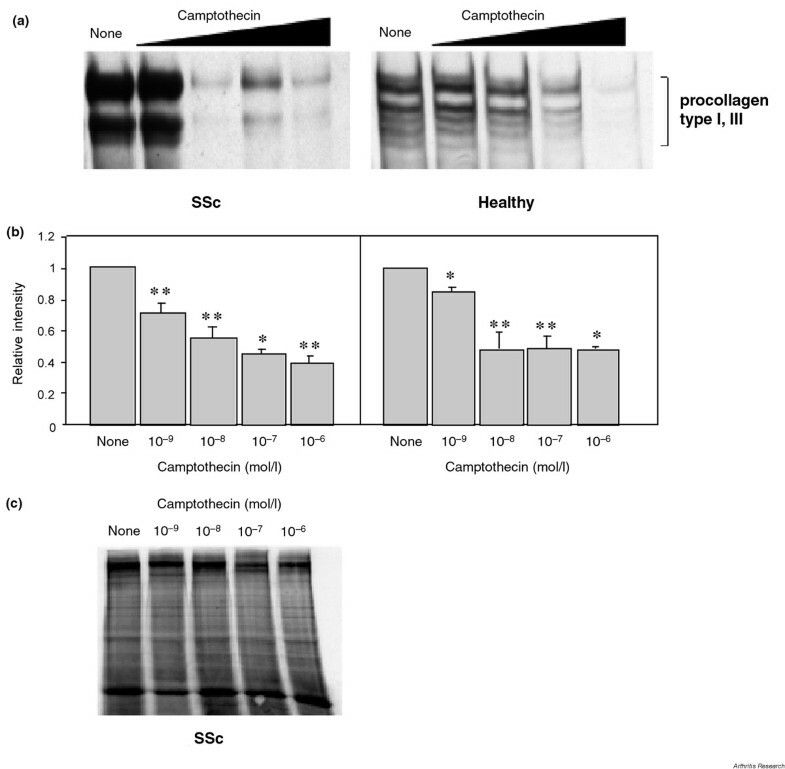 Bars show means ± SEMof the COL1A2/GAPDH ratio from 13 independent experiments using seven different pairs of SSc and healthy control fibroblasts. COL1A2 = type α2(I) collagen; CPT = camptothecin; GAPDH = glyceraldehyde-3-phosphate dehydrogenase; SSc = systemic sclerosis. *P < 0.01, **P < 0.005. The transcriptional activity of the human COL1A2 promoter fragment (-353) linked to the CAT reporter gene was examined in transient transfection assays after CPT treatment. Consistent with the mRNA data, the maximal inhibition of collagen promoter activity was 60% (Fig. 4), suggesting that the inhibitory effect of CPT on the COL1A2 gene occurs at the transcriptional level. As previously reported, CPT has no effect on the activity of the control vector . 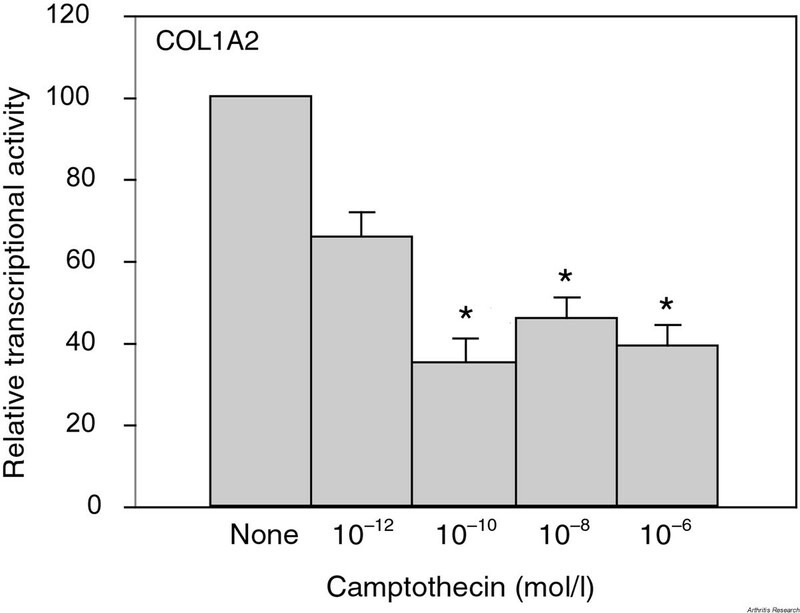 The activity of the collagen promoter was inhibited by much lower doses of CPT (10-12 and 10-10 mol/l) than those that inhibited collagen mRNA levels (10-8to 10-6 mol/l). This probably reflects the difference in sensitivity to CPT between exogenous and endogenous promoters due to the protective role of chromatin surrounding the endogenous promoter. CPT inhibits COL1A2/CAT promoter activity. Human dermal fibroblasts were transiently transfected with 20 μg of COL1A2/CAT promoter construct and treated with CPT (at 10-12 to 10-6 mol/l) for 24 h. Samples of cell extracts were normalized for protein concentration. Comparisons of the promoter transcription activity after CPT treatment were made between unstimulated and CPT-treated cells (done in duplicate). Transcriptional activity of the COL1A2/CAT gene in the CPT-free control ('None') was arbitrarily set at 100. Bars show mean ± SEM from 11 independent experiments (*P < 0.01). COL1A2 = type α2(I) collagen; CAT = chloramphenicol acetyltransferase; CPT = camptothecin. DNA Topo I is an essential enzyme involved in such crucial cellular functions as replication and transcription. This study was undertaken to determine whether inhibition of its activity by noncytotoxic doses of CPT, a drug that selectively targets Topo I, could reverse the activated phenotype of fibroblasts from patients with SSc. CPT, an alkaloid that exists in nature and has been used for centuries in traditional Chinese medicine, is a prototype of a new class of anticancer drugs . It is commonly used in in vitro experimental model systems to study the mechanisms of action of Topo I inhibitors. Clinically approved Topo I inhibitors, irinotecan and topotecan, are semisynthetic derivatives of CPT that differ from CPT in toxicity profiles and water solubility but not in the mechanisms of action [16,17]. Our results show that CPT significantly inhibits the synthesis of collagen by dermal fibroblasts from patients with SSc. The production of types I, III, and VI collagen was significantly inhibited in SSc and healthy control dermal fibroblasts without affecting total protein synthesis. The inhibitory mechanism of CPT was further examined using COL1A2 as a representative collagen gene. The drug inhibited COL1A2 steady-state mRNA levels and promoter activity by 60%, indicating that it directly inhibits transcription of this collagen gene. It is not known why collagen genes, and particularly type I collagen, are more sensitive to CPT than other genes. The drug either may directly interfere with the transcription of collagen genes or may influence signaling pathways that regulate collagen gene expression. The role of Topo I in the initiation of transcription has previously been shown . These previous studies have revealed that Topo I can act as either an activator or a repressor, depending on the promoter and the presence of other transcription factors . It has been proposed that Topo I may be directly involved in transcription of interstitial collagen genes . The nucleotide sequences of these genes contain specific DNA motifs that constitute high-affinity Topo I binding sites . Three such DNA motifs reside within the COL1A2 promoter . Further studies are needed to determine whether Topo I plays a direct role in the regulation of type I collagen transcription. Recently, a new role for CPT has been proposed . It has been shown to activate transcription factor NF-κB in various cell types, including a fibroblastic cell line. The activation of NF-κB by CPT involves degradation of the cytoplasmic IκBα by the ubiquitin-proteasome pathway. Topotecan, a clinically approved derivative of CPT, showed similar effects. The activation of NF-κB by CPT may be directly related to the mechanism of CPT COL1A2 gene regulation. It has been shown that the inhibitory effect of TNF-α on COL1A2 gene transcription is mediated via NF-κB . Thus, CPT may inhibit COL1A2 by a mechanism involving activation of NF-κB. This hypothesis could be tested using other DNA topoisomerase poisons known to induce NF-κB . Despite significant progress towards understanding the pathogenesis of SSc and other fibrotic diseases, effective treatment is still lacking. Specific compounds that have the potential to inhibit collagen production such as CPT and the recently described inhibitor of geranylgeranyl transferase I  may prove to be clinically useful in the treatment of fibrosis. In conclusion, our study shows that CPT has a potent selective inhibitory effect on collagen gene expression; however, the specific molecular mechanisms of action are presently not known and will require further study. The inhibitory effect of CPT on collagen gene expression suggests that Topo I inhibitors may be an effective treatment for limiting fibrosis in SSc patients. Dermal fibroblasts were obtained from patients with diffuse SSc and healthy volunteers. The patient group consisted of 18 individuals (10 females and 8 males), whose mean age was 39.5 ± 2.6 years (range 30–51). All patients fulfilled the American College of Rheumatology (formerly American Rheumatism Association) criteria for the diagnosis of SSc . They were recruited from the Department of Dermatology, Warsaw Medical School, Warsaw, Poland, and the Division of Rheumatology and Immunology, Medical University of South Carolina, Charleston, SC, USA. All the patients enrolled in the study had been recently diagnosed with SSc and their disease duration was between 1 month and 1 year. When the skin biopsy was performed, patients were not receiving any treatment known to influence collagen synthesis or deposition. The control group included 18 healthy donors with a mean age of 41.0 ± 3.3 years (range 23–60). Informed consent was obtained from patients and healthy donors before each biopsy was performed. SSc dermal fibroblast cell lines were established from biopsy specimens obtained from clinically affected skin (on the dorsal forearm). Control dermal fibroblasts, from healthy donors matched for race, age, and gender with donors of SSc cell lines, were obtained by skin biopsy within several days of the SSc biopsy and were processed in parallel. Each biopsy was dissociated enzymatically by 0.25% collagenase type I (Sigma) and 0.05% DNase (Sigma) in DMEM with 20% fetal bovine serum (FBS) (HyClone). The fibroblasts were cultured in DMEM containing 10% FBS and 50 μg/ml gentamicin (Sigma). For experiments, cells were starved in serum-free-medium (0.1% BSA in DMEM) for 48 h before the addition of CPT (Sigma) in DMEM/1% FBS. The fibroblasts used for experiments were from passages three to six. CPT (Sigma) was dissolved in dimethyl sulfoxide (Sigma). Aliquots of stock solution (10 mM) were stored at -70°C and diluted further in 1% FBS/DMEM immediately before each experiment. Fibroblasts (104 cells/well) were seeded in 96-well flat-bottom culture plates (Costar, Corning, NY, USA) and treated with CPT for 24 h. Deposition of collagen and elastin in cell and matrix layers was determined by solid-phase ELISA with antibodies against goat anti-collagen I (Chemicon), mouse anti-collagen III (Telios), mouse anti-collagen VI (Telios), or mouse anti-elastin (Sigma), at dilutions recommended by the manufacturers. For determination of newly synthesized collagenous proteins, fibroblasts were plated in 12-well plates and grown to visual confluency. The medium was changed to serum-free medium (1% BSA/DMEM) supplemented with 50 μg/ml of ascorbic acid for 48 h. Cells were treated with CPT (from 10-9 to 10-6 mol/l) in the presence of ascorbic acid for the next 48 h. 20 μCi/ml of [3H]proline (NEN, Boston, MA, USA) was added during the last 24 h of incubation with CPT. Medium was harvested from each well and cells were trypsinized and counted. Medium was dehydrated in a SpeedVac (Savant, Holbrook, NY, USA). Aliquots of media normalized for cell number were denatured by boiling them in the SDS sample buffer and were loaded on 6% SDS–polyacrylamide gels. After electrophoresis, gels were enhanced by immersion in 2,5-diphenyloxazole (PPO) and visualized by autoradiography. The intensity of collagenous protein bands was quantitated using NIH-Image. The effect of CPT on total protein synthesis was studied using metabolic labeling with [35S]methionine followed by SDS–PAGE and autoradiography. Fibroblasts were grown to confluence in 12-well plates, starved for 48 h, and treated with CPT for the next 24 h. After CPT treatment, cells were incubated in methionine-free medium (Gibco), and 10 μCi/ml of [35S]methionine (NEN) was added for the next 4 h. Cells were solubilized in RIPA buffer (50 mM Tris–HCl [pH8.0], 150 mM NaCl, 0.02% sodium azide, 0.1% SDS, 100 μg/ml phenylmethylsulfonyl fluoride, 1% NP-40, 0.5% sodium deoxycholate, and 10 μM sodium orthovanadate). Protein concentrations were normalized for cell number and separated by 6% SDS–PAGE. Fibroblasts were grown to confluence in 10% FBS/DMEM and then incubated in serum-free medium. The cells were treated with CPT at concentrations from 10-9 to 10-6 mol/l for 24 h. Total RNA was extracted and analyzed by northern blotting as described previously . Membranes were sequentially hybridized with radioactive probes for α2(I) procollagen and GAPDH and scanned with a PhosphorImager (Molecular Dynamics, Inc., Sunnyvale, CA) for mRNA quantitation. SSc and healthy dermal fibroblast RNA samples were analyzed together. Transient transfections of normal dermal fibroblasts were performed by the calcium phosphate/DNA coprecipitation technique as described previously . Briefly, the cells were grown to 70% confluence in 100-mm2 dishes in 10% FBS/DMEM and were transfected with 20 μg of plasmid DNA containing the -353 fragment of the collagen α2(I) promoter linked to the CAT reporter gene (-353 COL1A2/CAT construct). The pSV-β-galactosidase control vector (Promega) (2.5 μg) was co-transfected to allow normalization for transfection efficiency. The day after transfection, cells were treated with CPT (at concentrations from 10-12 to 10-6mol/l), and incubation was continued for the next 24 h. CAT assays were performed as described previously . Cell extracts normalized for protein concentration were used to measure CAT activity, and the values obtained were corrected to reflect the efficiency of transfection relative to the co-transfected pSV-β-galactosidase vector. This research was supported by grant 4S402 0406 from the Polish Committee for Scientific Research, and grant AR 42334 from the National Institutes of Health, USA.